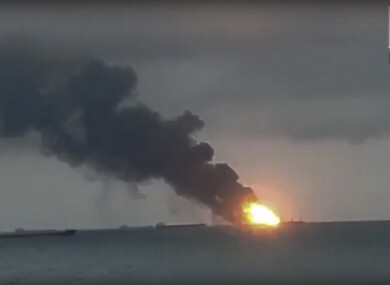 In this video grab provided by the Kerch.fm web portal, the two vessels, the Maestro and the Candiy, on fire near the Kerch Strait linking the Black Sea and the Sea of Azov, in Kerch, Crimea. FOURTEEN PEOPLE HAVE been killed and five are missing off Russia-annexed Crimea in the Black Sea after a fire engulfed gas tankers sailing under the flag of Tanzania, authorities said. “There are 11 bodies,” Alexei Kravchenko, spokesman for Russia’s Federal Agency for Maritime and River Transport, told AFP. Twelve people had survived, Kravchenko said, but “no one knows where the other five people are”. Email “14 dead after fire on two ships off Crimea”. Feedback on “14 dead after fire on two ships off Crimea”.